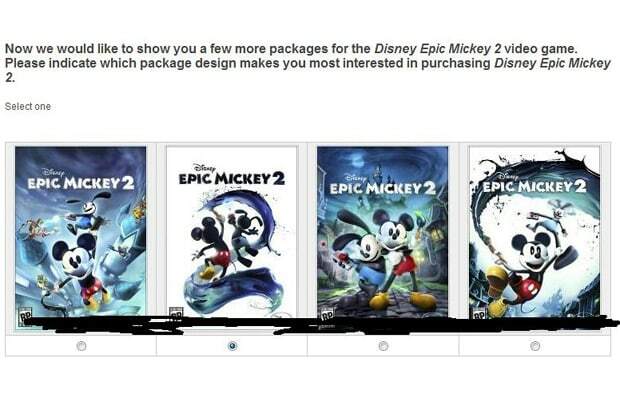 Is "Epic Mickey 2" Coming in 2012? According to Disney blog Stitch Kingdom, a Disney newsletter has revealed that a sequel to the Wii platformer Epic Mickey is already in development and on track to hit stores at the end of this year. Rumors that a sequel to the game began to form after a survey from Disney Interactive asked consumers to comment on prospective box art for the game, and strengthened recently when a Dutch newsletter (likely the same one Stitch Kingdom got their hands on) discussed plans for the game. The announcement says little about the plot or new mechanics, but does mention that the game will be released for Xbox 360, PS3 and Wii. There was no mention of the Wii U or any other platform. Also, the team will be focussing on creating a co-op mode, where one player controls Mickey, while the other plays as Oswald the Lucky Rabbit, returning from the original. Oswalt will apparently be able to "fly like a helicopter" with his ears and shoot lightning. Disney Epic Mickey 2 is the latest game in the critically acclaimed Disney Epic Mickey videogame series. In this all-new action-platforming game available for Xbox 360, PlayStation 3, and Wii, Mickey embarks on an epic journey and is pulled back into a world filled with Disney&apos;s forgotten characters. "Players can choose to play single-player as Mickey or for the first time players can also choose 2-player split screen mode. "In the 2 player mode one person can play as Mickey wielding magic paint and paint thinner to dynamically change the world and the second player can play as Oswald the Lucky Rabbit - Walt Disney&apos;s first cartoon star - with the power to fly like a helicopter and use electricity to fight or friend enemies and solve challenges. "Team-up and choose your path to save this forgotten world because the choices you make will alter the story and change the end of the game!" Now that the rumors have popped up three times, do you think Epic Mickey is on the way? More importantly, do you find that exciting? Let us know in the comments.